In a region best known for its rugged terrain and dry desert ecology, avid birders, Carolyn Ohl-Johnson and her late husband Sherwood, created something magical in the Christmas Mountains of West Texas. It’s a refuge for birds, butterflies. Started in the 1990s, the couple developed ways to capture water that fell or flowed on their property. And I told him how we could put in some diversion dams, and he just hopped right on that without greasing his equipment the same day! And so we started out with one tank that wasn’t nearly big enough. So began a lifelong passion to establish an oasis in the middle of the desert to draw birds to her West Texas home. The Texas Parks and Wildlife TV series on PBS features Carolyn’s oasis on this week’s show. I can be sitting here, just looking at the same old stuff, and bet money that nothing interesting’s gonna come along. And there, all of a sudden, oh my gosh, there’s a lifer! But it won’t happen if I’m not sitting here looking, so what do you do! You sure don’t get much work done, that’s for sure. Tune into the Texas Parks and Wildlife TV series on PBS through August fourth to see not only Carolyn’s oasis, but another lush wetland project in West Texas. Check your local listings. 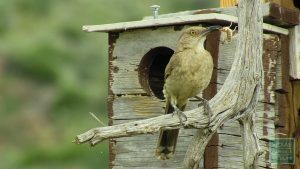 This entry was posted on Wednesday, August 1st, 2018 at 12:00 am	and is filed under Birding, feeding, hummingbirds, Nest Boxes, TPWD TV, Water, Wildlife, Wildlife and Sport Fish Restoration Program. You can follow any responses to this entry through the RSS 2.0 feed. You can skip to the end and leave a response. Pinging is currently not allowed.